It used to be that baseball teams would seek strength up the middle defensively, but in today’s age is it more important that a team has a strong middle of its lineup? We all know balls in play are on the decline, so has it also become more important to find hitters who can turn them into hits, or defenders who can turn them into outs? Jorge Polanco seems like the perfect player to apply this question to. This story helps set the stage for a truly pivotal offseason ahead. It's just a taste of what you'll find in the 2019 Offseason Handbook, which is currently available for preorder. If you wanna learn more about it, and the benefits of preordering, check out our FAQ. Polanco’s 80-game suspension derailed his 2018 season, but he provided a solid bat upon his arrival. From July 1, 2017 through the end of this season, a sample of 624 plate appearances, he hit .279/.340/.445 (.785), good enough for a 110 wRC+. To put that into perspective, shortstops combined to hit .255/.315/.409 (.724) with a 95 wRC+ in 2018, per FanGraphs. But Polanco’s defense has not been as good, to put it kindly. Despite missing half the season, Polanco committed 13 errors. Only nine other shortstops had more. Polanco had the third-worst fielding percentage of the 35 shortstops who logged at least 500 innings at the position this season and the second-worst UZR/150. But is the offensive production worth the drop in defensive ability? It’s no secret that strikeout rates have escalated the past few years. League average K% has gone up from 17.5 in 2008 to 22.3 in 2018. At the same time, walk rates have remained about the same and home run-to-fly ball ratio has increased from 10.1 percent to 12.7 percent. There are a lot of factors at play in why those numbers have changed, but the end result is fewer balls in play. Last season, the average team had 38 plate appearances per game and a ball was put into play about 66 percent of the time. That gives us a total number of 25 balls in play you can expect your defense to have to try and field in an average game, but of those how many are actually difficult plays? If we look at the Inside Edge fielding numbers for the Twins this season, which are available at FanGraphs, it would appear the vast majority of balls in play fall either into the routine play or impossible categories. So 81.2 percent of all balls in play were deemed as either routine or impossible and another 6.4 percent land in the 60-90 percentile, leaving only 12.4 percent of all balls in play having a likelihood between 1-60 percent chance of being made. Since there are 25 balls in play each game, that means your defense is only going to be asked to try to field about three of those type of plays in a game. And, of course, your shortstop isn’t even necessarily going to be one of those asked to make those plays. Taking a look ahead to the offseason, the Twins could make a defensive improvement and sign a shortstop like Jose Iglesias with the intention of shifting Polanco over to second base. On the other hand, Iglesias only hit .269/.310/.389 with a 90 wRC+, and even that was a very strong year for him at the plate. 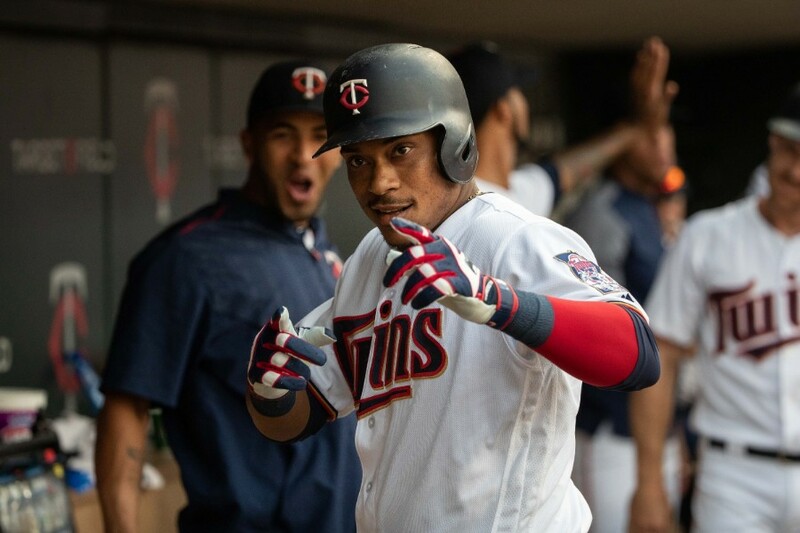 Keeping Polanco at shortstop and signing a stronger bat to plug in at second base would leave the Twins a little light in terms of infield defense, but it might be worth the extra firepower. For example, free agent second baseman Jed Lowrie hit .267/.353/.448 with a 122 wRC+ for Oakland. You can apply this same kind of thinking across the diamond. Byron Buxton, Max Kepler and Jason Castro all bring plenty to the table defensively, but it's also pretty difficult to try to project any of them to be above league average at the plate. There still may be some growth left with Kepler and Buxton, and you wouldn’t want to go out and downgrade every spot on the diamond, but I still feel like the Twins are in a position to sacrifice defense in order to improve their offense. Circling back to Polanco, of course the Twins would prefer to have a better defensive shortstop, but there are so few two-way players at the position. Even Manny Machado, one of the big fish on this year’s free agent market, leaves a lot to be desired as a shortstop. Also, while Polanco will never be a plus defender at short, I’m hopeful he can avoid some of the mistakes he made in 2018. Often times he seemed rushed -- like the game was a little too fast for him -- on the blatant errors he committed on what should have been routine plays. We didn't see that as often in 2017, which makes me wonder if the suspension had anything to do with the backslide he made in the field. Polanco does not fit the ideal profile at the position, but from a big-picture perspective keeping him as the shortstop gives the Twins a better overall chance to be successful in 2019. For more on Manny Machado, Jose Iglesias, Jed Lowrie and all the other middle infield free agent options, make sure to preorder the Twins Daily Offseason Handbook. Often times he seemed rushed -- like the game was a little too fast for him -- on the blatant errors he committed on what should have been routine plays. I imagine a player with an insufficient arm for a position might feel rushed at times. Under that logic, the Twins should just cut bait with Buxton now and move Kepler to cf full time. Why pay a premium price for premium defense that is unimportant? Here are three generalizations I believe to be true: 1) Good defense helps make pitchers better. 2) As our defense improves, so does our pitching.3) Good defense often ignites a team.However, also true is the following: No generalization is worth a damn, including this one. The batting averages between Kepler and Buxton seem somewhat close to each other...220-240. Might as well keep them both and see what happens this year. "220, 221 whatever it takes...." Mr. Mom reference circa 1983? I understand the game is changing and defense at SS is not as important as it once was. That said, I think the position is still the most important position defensively. IMO, I would move Polanco to 2B, which most people seem to think would be a better fit for him. More than likely, he will need a new position once Lewis arrives anyway. Iglesias would be a good fit to fill in for a year or two until Lewis comes up. If Lewis ends up in the OF, a guy like Iglesias, who is only 28 years old, can probably hold the fort down until Wander arrives. I think it is imperative that the Twins sign a middle infielder, so to me, this seems like the way to go. I've been saying for years that corner OF defense isn't worth worrying about. However, I don't feel that way about C, SS, 2nd base, and to a certain degree, CF. Catcher handles the ball on almost every pitch. SS and 2nd base HAVE to turn ground balls into outs, virtually every time, and there are a lot of ground balls between the two of them. The SS or 2nd baseman are going to take every relay from the OF. They handle the ball, a lot. So IMO, no...in addition to the errors, Polanco just doesn't turn enough ground balls into outs. Defense. Even at this elevated and ridiculous rate of strikeouts we still have 70% of the balls put in play and defense makes a tremendous difference for pitching and team confidence. When you watch Chapman at third base for Oakland you can already begin to see how the other players look to him and loved his plays in the field.and one of the playoff games there was actually a discussion about how the team came together as the defense improved. I do not want to see 8 Sluggers standing around in the Outfield and infield watching pop-ups hit the ground. And I want to see a better defensive shortstop. I still believe that the shortstop is the captain of the infield and sets the tone for all the others. He definitely needs to be moved to 2nd base. Also, Mauer, who is one of the better defensive 1st basemen in the league, is retiring and as of right now the Twins are replacing him with Austin. I wonder how many errors Mauer has saved by being one of the top defensive 1st basemen in the league? This is a big one.Judging how the replacements to Mauer have done over the past two years I am guessing Mauer has saved somewhere between a lot of runs and a whole lot of runs.I was actually thinking I am ok with Polanco at short.He should only get better with reps and his arm doesn't appear all that weak to me but you reminded me I am only ok with Polanco at short as long as Mauer or someone else really good is at first. Most players that let loose overthrow their target but Polanco does it smart by throwing low. It only works if there is a guy on the other end that catches balls in the dirt routinely. Hrbek, Mauer and mr. alphabet have been the only Twins that have done that. Nobody ever said defense is unimportant. It's not like I'm suggesting Miguel Sano move back to short and Eddie Rosario come in to play second. But to your point on Buxton, if he can't outproduce his career line to this point, they do need to be prepared to try something else, as I wrote earlier this month. His defense isn't worth an 80 OPS+ in the lineup. I've got nothing against Jose Iglesias, but he just doesn't fit on this Twins club as it's currently built. If you're making an upgrade over Polanco, I feel like it's gotta be on both sides, offense and defense, or else you're basically making a lateral move. I love Matt Chapman, but if he would've hit like Matt Walbeck that team wouldn't have gone anywhere. Did you get a chance to watch much of Tyler Austin, or even Miguel Sano, at first base? Not saying I'd put them up on Mauer's level, but I was surprised at how they looked over there. Of course, the Twins may bring in another guy to play first, but these are all guys who have the hand-eye coordination to hit 100 mph fastballs. They can pick a throw from shortstop. By the way, last season Joe Mauer had 20 scoops in 753 2/3 innings played at first base, per FanGraphs. That's basically one scoop per every four games he played there. It's a valuable skill, no doubt, and you'd much rather have a guy at first that can pick it than somebody with stone hands, but I think it's an overvalued skill. This times 100. Also imo. Polanco's OPS and wRC+ would still be top 10 as a second basemen.You lose a little bit there, but gain a lot defensively. Basically, he's a premium hitter whether he plays 2B or SS, so better that he plays the position where he can be a plus defensively rather than a minus. Not really.....they have both Buxton and Kepler, but they need a SS or 2B. So, the question is, which should they pursue? Also, if you think Gordon is really a 2B.....maybe you try Polanco 1 more year at SS. I don't know the right answer on this one, frankly. With Lewis and Gordon a year or two away...things are a bit muddy, unless you are really trying to win next year big time. Not to mention other 1B also had scoops.....that ability is in the defensive rankings, and there just isn't that much difference between 1B at the MLB level. These guys have been fielding grounders since they were 7 ......or 5. In the absence of an exceptional defensive 1st baseman arriving via trade or FA, I'd argue this is the primary reason to shuffle Polanco to 2nd and add a stopgap SS with above-average defensive skills. I personally don’t believe Gordon will ever be a better hitter than Polanco already is. Polanco was hitting MLB pitching decently at age 22. Gordon has not yet proven he can hit AAA pitching. Probably not....but that's not the point. The question is how best to use those two players. Maybe trading one is the answer, maybe playing them both is the answer......I don't know. But if you think Gordon is destined for 2B, maybe you try Polanco at SS another year. The Twins would be ill-advised to count on a banjo hitter like Arraez at any time, let alone some time in 2019. Even if he DOES amount to something, I don't see the logic of keeping Polanco at SS so as not to block Arraez at some future time. And frankly, one could make the argument that Blankenhorn, Gordon, and Severino are ultimately more likely to be successful MLB 2nd basemen than Arraez, and maybe on an equal or faster timetable. That would be my own bet. The question to me is this: since you know you need an external option to start 2019 at one or the other position, which makes more sense? Do you try to sign Iglesias and move Polanco? Do you sign Jed Lowrie or someone and keep Polanco at SS? I think it's foolish to think a whole lot about the timetables for Gordon, Lewis, Arraez, or anyone else in the system. We have a problem that needs an April solution, not a September one. I vote to find a SS, via trade most likely, to man the position for maybe two years. Trade the guy if Lewis, Javier, or someone else nudges them aside. And if Arraez or Gordon are ready for the show at 2B, make some calls and see who's interested in them, or in Polanco. Sign Manny, move Jorge to 2nd and move Manny when Lewis is ready. Best infield in the league for 5+ years. I wouldn’t know which is the better shortstop. Presumably, someone working for the Twins does. That said, I agree with not basing a 2019 infield deployment on a mere prospect who got a first taste of AA. Polanco has been moved from 2B to SS in the recent past. He could be moved back there again, if 2B looked like the right place for him at the present and then conditions changed. Cheap is good, sushi is good, cheap sushi not so good. I agree that Polanco is fine at SS but it also depends on what are other options are for SS and 2B. This article talks about 2 options a better defensive yet worse hitter in Iglesias and an extremely expensive better hitter in Machado. Between these two options yes Polanco should ve the SS choice and Lowrie would be a good 2B option if he doesnt resign with Oakland. I have't researched the 2B and SS options yet in bith FA and trade....remember we have tons of young player capital and i wouldnt be surprised if we used some to reahape the roster.